Ask any of our hundreds of students: the Cloud 9 Paragliding School is utterly dedicated to creating the perfect learning experience for our students. Our staff of instructors is composed entirely of pilots who love teaching as much as they love the sport — and that’s saying something. We are the nation’s largest paragliding school, and that distinction carries with it many benefits for our students: for example, Cloud 9 Paragliding is the only school in Utah to offer lessons 7 days a week, year-round. 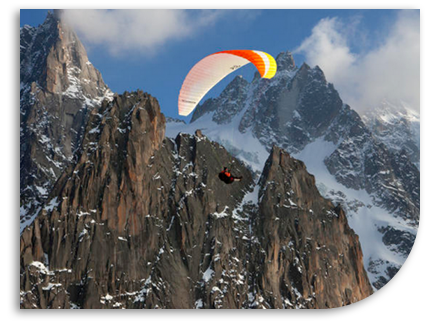 (Don’t worry about the cold: winter is an excellent time to learn to paraglide!) The expansive Cloud 9 Store is another benefit: we’re dealers for many brands of paragliders and accessories, so we’re able to offer the best prices possible to our students when they’re ready to pick up their own gear. The morning of each lesson we will meet at the Point of the Mountain to plan each day’s activities. Meeting times vary depending on the time of year. Morning lessons go from just after sunrise for 2-3 hours (or in the event that weather conditions shut us down). The Cloud 9 school teaches paragliding year-round. Training begins with basic ground school, then quickly moves to canopy control (kiting) skills. Soon we move down the mountain to the “bunny hill” and work on launching and landing techniques on a gentle slope. Many lessons end with an hour of review, theory, and simulator work at the shop located 5 miles from the training site. Once you have mastered these basic skills (usually by the second lesson), you’re ready to fly off the top of the hill and are on your way to mastering the art of flying with the birds. If you started somewhere else or have experience and feel the above courses are above and beyond what you’ll need, we offer a pay as you go program. We will decide on your experience if this program suits you. (P1 Pilots, Foreign rated pilots, etc) Inquire for details. The minimum requirement is 7 training days so previous training is a requirement. Cloud 9 students get a special rate when they book the local Ramada Inn Draper, Utah for their visit to Salt Lake City. There are also great local pilots who host trainees www.flythepoint.com or Airbnb.com (Draper or Lehi). Limited camping is also available on at the South Side Flight Park.